Now I've never done one of these before so do bare with me but i decided to show you lovely people what i have on my nails because i just think it's so pretty! Anyho the nail vanish it by BarryM and is a lovely bright Christmasy red glitter! I love the bottle for some reason and the colour is my favourite but i have to say I'm not all that impressed with the texture of this. Its very rough and also as soon as it drys the colour goes dull so it hardly sparkles at all. It does only need 2 coats which is good for sparkly nail vanish and priced at £2.99 i can hardly complain i guess. 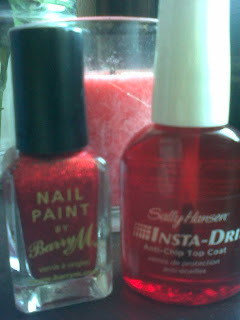 The brilliant thing about all this is that it has made me discover Sally Hansen Insta-Dri anti chip top coat! 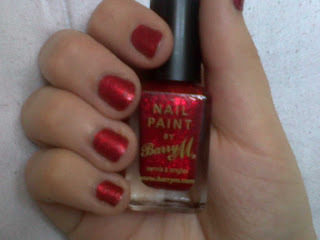 I love this stuff, as soon as i put it on over the dull, sad looking red polish it came alive! The sparkle was there in full effect and it has lasted 2 days so far still staying in perfect condition. I don't know why but I have been holding myself back from getting Sally Hansen products for so long because i felt like i didn't need them but after this i may be delving in a little deeper! I found this at a discount place near where i live for £2.99, which is a bargain considering at Boots it retails at £5.99 (find HERE) but I'm sure you can find some good online deals for it as well. A few products for Santa to treat me to!